When it comes to Atlanta, there’s no bigger name in sports than Dominique Wilkins. The “Human Highlight Film” is perhaps the city’s most revered athlete — as evidenced by the bronze statue of him dunking outside of Philips Arena. 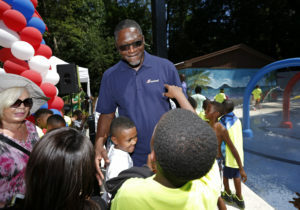 Nique was a Hall of Famer on the court, but he’s been an even better community ambassador off the court as a national spokesperson for Boys & Girls Clubs and diabetes charities (Dominique is diabetic). When Carnival Cruise decided to create a new community water park at Atlanta’s Adams Park — a spot where Wilkins started youth basketball more than two decades ago — it only made sense for one man to open “Splash Island” alongside mayor Kasim Reed. Grizzly was thrilled to make the connection happen and Dominique is eager to cruise the Carribbean with his family on a Carnival ship later this year.